This photo came up in my Facebook feed last week. I had to share the love, both on Facebook and here. “The Great Atlantic & Pacific Tea Company, better known as A&P, was an American chain of grocery stores that ceased supermarket operations in November 2015, after 156 years in business. 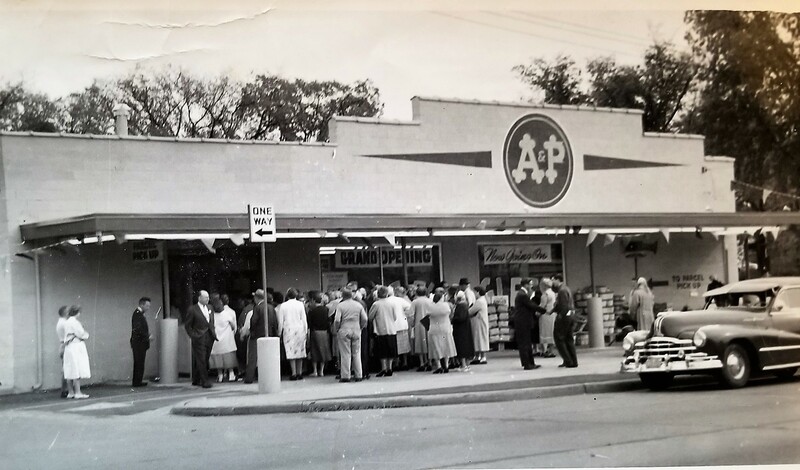 From 1915 through 1975, A&P was the largest grocery retailer in the United States (and until 1965, the largest U.S. retailer of any kind). A&P was considered an American icon that, according to The Wall Street Journal, ‘was as well known as McDonald’s or Google is today’, and was ‘the Walmart before Walmart’. Founded in 1859 by George Gilman as ‘Gilman & Company’, within a few years the firm opened a small chain of retail tea and coffee stores in New York City, and operated a national mail order business. The firm grew to 70 stores by 1878, when Gilman passed management to George Huntington Hartford, who turned A&P into the country’s first grocery chain. My dad was employed by the Great Atlantic and Pacific Tea Company for most of his life, over 40 years. Early on in his career, when he managed an A&P store in Milwaukee, my mother was the bookkeeper. They dated for awhile and then dad was sent to small-town Waupaca to manage what was a much smaller A&P store. Dad missed mom while in Waupaca, so asked her to be his wife. 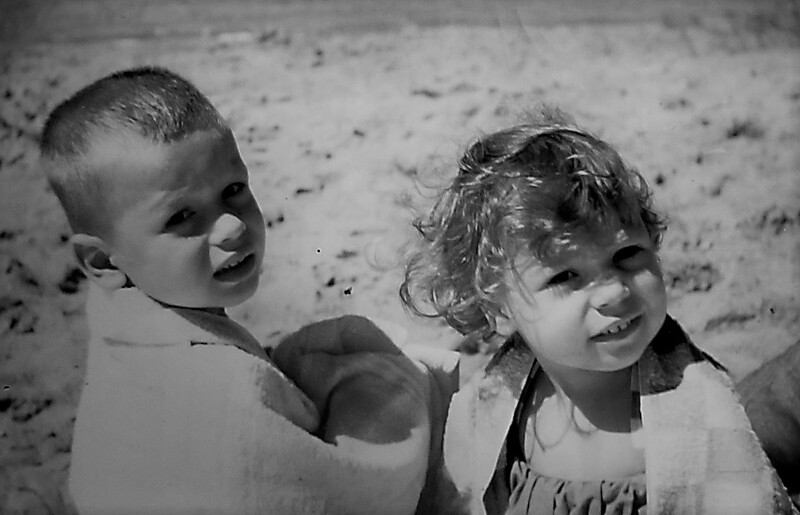 In 1954, after the wedding, mom and dad settled down in Waupaca and raised two bratty adorable children. 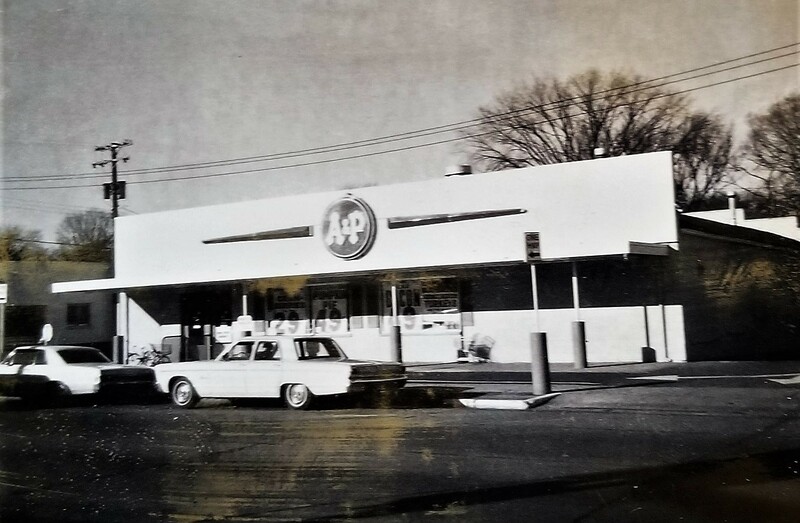 Memories of the A&P store in Waupaca remain, although it’s been gone since about 1974. A liquor store took its place, but the building was eventually demolished in favor of a Kwik Trip gas station in 2011. Unfortunately, dad did not date this photo. I would guess it was taken around the mid 1950’s. If anyone can guess the make, model and year of that vehicle, there are one billion bonus points at stake and I will have a better idea of when the A&P store in Waupaca had its grand opening. Dad taught his adorable bratty children the value of a solid work ethic. He took his position seriously and worked hard to manage his store and supervise the employees. I don’t remember his name, but I remember his face and the bow ties that all of the employees wore. Looking at this photo, the store seems so small now. When you’re a child, everything is bigger, grander and cooler than when you’ve long been an adult. One summer, on our way to the A&W in a near-by town for hamburgers and root beer, dad had to stop at the store. I do not remember why. However, it was June and the June bugs were flitting around in numbers at the front of the store, drawn there by the lights. One of those damn bugs flew into our Chevy Impala and into the back seat. I freaked. And screamed. And freaked. I’ve hated June bugs ever since. The meat counter was fabulous in 1972! I would have worked for my dad as a teenager; however, the A&P prohibited managers from hiring family members. That’s understandable. The company did make an exception for my mom, since she was a former employee. Mom helped out at the store for awhile, when my brother and I were somewhat responsible teens who could take care of ourselves after school and not get into much trouble. When I was around 16 or 17, dad was informed the Waupaca store would be closing and he would be transferred to the A&P in Oshkosh. It was a bigger store in a bigger city and dad seemed to accept the news graciously. What else could he do? I did not feel so gracious as I had to spend my last year of high school with other teenagers previously unknown to me. I was pretty shy, so friends were few and I never felt that I meshed with the culture. 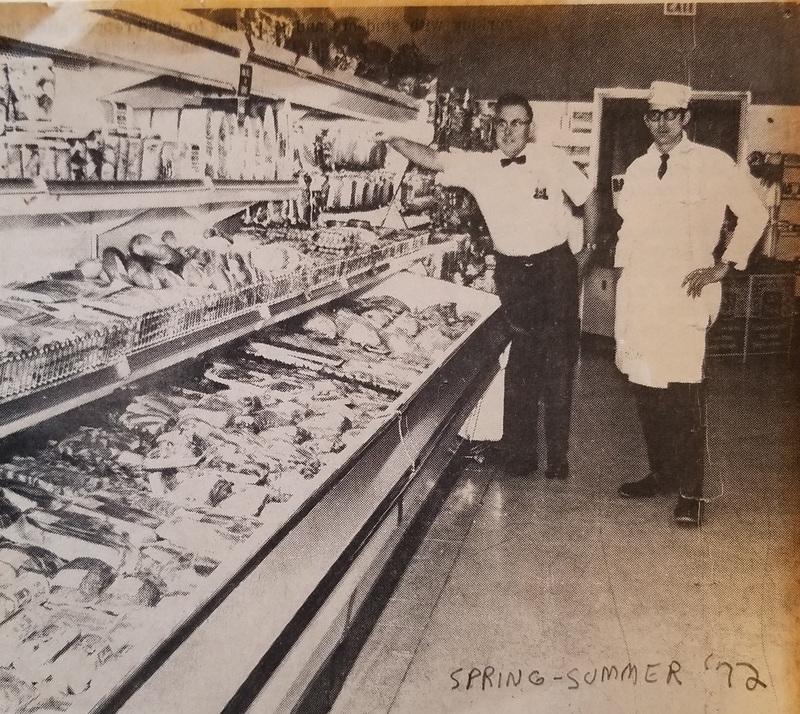 Dad’s time in Oshkosh was short (about two or three years), during which time he survived an armed robbery and the closing of this store, and he saw his daughter obtain a job in state government. Like my “dear old father,” as he called himself, I’ve been working as a public servant for over 40 years. Dad not only passed on his love of sweets to me, but also the crazy work longevity thing. The next move for the end chapter of dad’s career was back to Milwaukee, where he eventually retired from the A&P. Dad worked another year or so for a Milwaukee drug store, until he and mom decided to move back to Oshkosh, as they loved the area and had made some very good friends. In retirement, dad was happy to take care of their home, garden, be active in his church and the Knights of Columbus, and continue to be parent to his two bratty, adorable, adult children. So fun that you have those old photos, and that you know the stories that go with them! It was a joy to read! Thank you for sharing! LOL – yeah, I’m right there with you on June bugs, and the need to keep stories fresh so we don’t forget them!! A wonderful trip down memory lane – complete with photos. Those are the most precious to supplement the memory. I love the photo of you and your brother. Yes – absolutely adorable. It’s good to have these old photos, and others like them, so I can always remember people, places and what occurred as I grew up. And once in a while, an old photo elicits a laugh or thought such as “What the heck was I wearing?” or “I remember that trip!” The post on Facebook was a reminder to check into the past on a gray, gloomy Sunday. What a wonderful look back and walk through your family history. I can only imagine changing high schools in midstream, that had to be hard. Those photos brought back so many memories. We took my grandmother shopping at A&P every Friday night. I remember going as a child and riding on the front of the buggy (that’s what they’re called in Pittsburgh) and I remember taking my grandmother shopping after I got my drivers license. I could probably still tell you where things were in that store. The car is a 1948 Pontiac, perhaps a Catalina, but I’m not sure. Dan! You have earned three quarters of a billion bonus points for knowing the make and year of the car. I had to hold back the rest due to the “not sure” part. It’s cool that a specific grocery store brought back memories of shopping with your grandmother. Even more amazing that you remember where everything was on the shelves. I remember the location of the meat counter and the bakery, but everything else is a blur. Probably because I never shopped at the store or cared about the location of canned goods or condiments. We also used to stand in line to get the cashier my grandmother liked. She went to our church and was one of my Sunday School teachers. I think the thing I remember most about A&P was the coffee grinders. Great Post! I remember our local A&P very well. It is fun to learn a little history about its origin and how your family was impacted by this company.. Thanks Charles. I love to take the old photos out every so often and take a trip down memory lane. It does my heart good and is certainly material for a post. 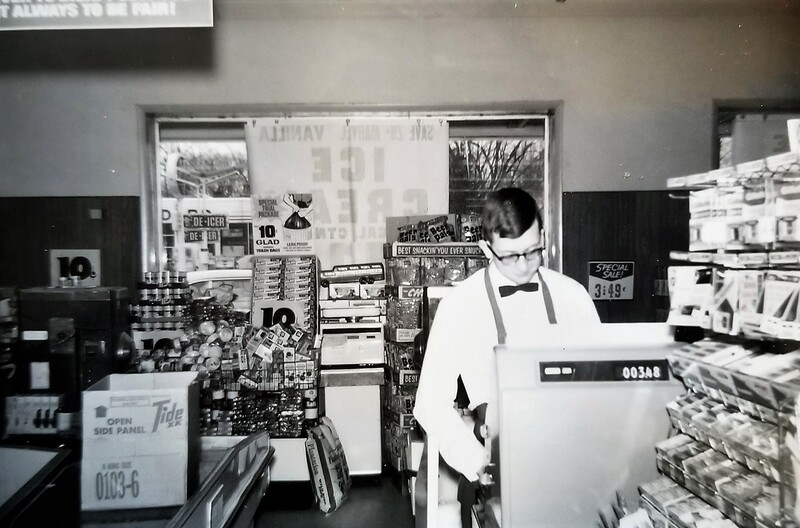 Working as a cashier at our local A&P was my very first job. My dad knew the produce manager and snagged me a summer job. Then when I moved down here to sunny Florida, there was an A&P in my neighborhood. Oh, the memories! This was wonderful, Mary. Being a cashier back then was not an easy job, Lois. Having to actually look at the price label, punch it into the register and COUNT CHANGE! You had a great learning experience and now have fond memories. An entire lifetime in a post. This looks like the structure of a much longer memoir. Love the nostalgia in the snaps. 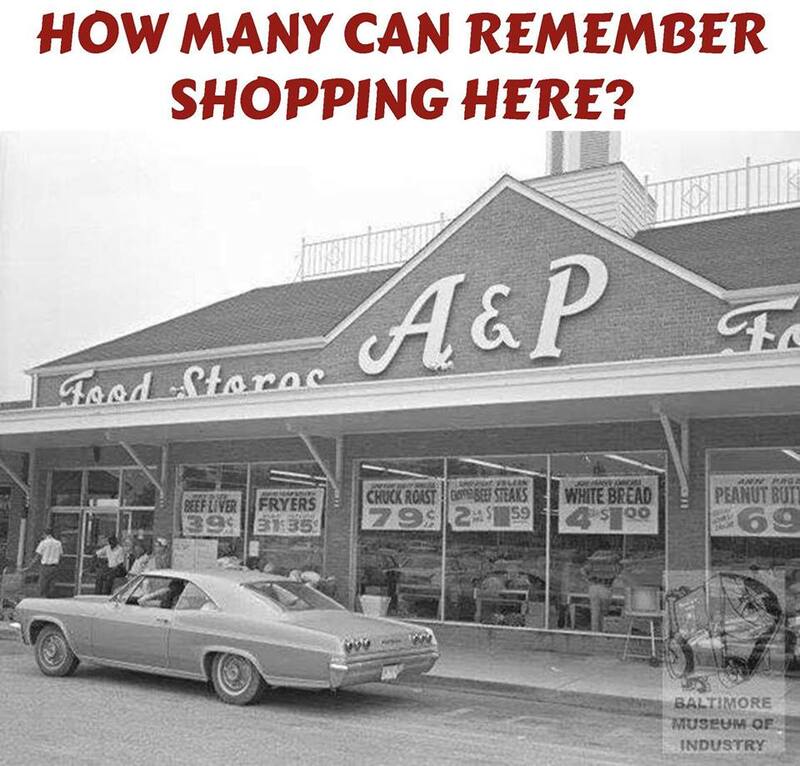 I surely do remember shopping at the A&P. It was a sad day when it went away. They did have some good items, but I was most excited when dad brought home day-old bakery and empty boxes (so my brother and I could build a box fort). I loved A&P and never knew the whole name, so thank you for that as well as for the story and photos..
You are very welcome Donnalee! That’s an old memory for me. Not like yours, but like a vague memory of those places being there. A&P signs were red with white bubble lettering — red and hot pink or red and orange, I can see the letters, but not recall exactly. I never knew what it stood for. My husband and I weird our kids out with places that used to be other places, because things change, but it’ll always be whatever it was called to us. There was a Safeway right by the house we live in now, but it’s long been gone. Still the Safeway Plaza, you know? We thought all the Safeways in the city were gone — but there’s one in the Brightwood neighborhood, which we thought was shocking. You and your dad definitely had that career longevity thing down pat. I think that happens less and less now. Great photos, especially of you and your brother. Thanks for sharing this glimpse into your (and the) past. You’re welcome, Joey. There used to be a Treasure Island store in Appleton and for years after they left town, it was always the old “Trash” Island building. Those memories are ingrained and sometimes it’s hard to let go…unless they tear it down for a gas station or strip mall.